This entry was posted in News & Events on February 21, 2017 by Jason Rackley. Well we are in to winter and again the weather this year so far is still very mild, we have only had a couple of frosts so the fish still seem very active looking at the lakes, Carp and Bream still rolling on hithermoor and moorlane. 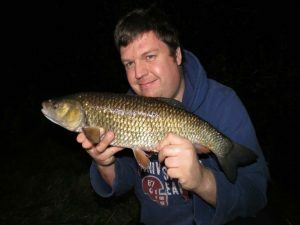 The river colne has been producing Chub and Barbel both ends would like some pictures of your catches to promote the club please and also dont forget we have trophys for most fish you could be top rod !. We had a work party at Moorlane to start clearing the area to the right of the bridge. 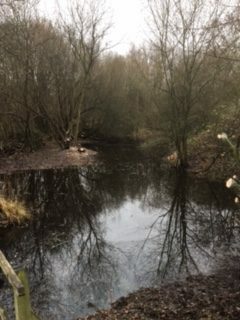 This is part of a proposed restocking plan we have for the front lake taking the enviroment agencies advise on creating and nursery area for small fish. The work party have cleared the first section as you can see in pictures with great results. We will be planning more work partys for this project and hope to get more members involved. The next club meeting is on the 19th of January at 8pm# all members welcome. We would like to take this opportunity to wish you all a Merry Christmas and a happy new year. Hope to see you on the bank with all your new tackle you have recieved for Christmas. This entry was posted in News & Events on December 18, 2016 by Jason Rackley. Calling all members we are going to have a work party at moorlane next Sunday the 18th at 9:30 am. Sorry it’s short notice but we would very much appreciate all that can spare a couple of hours. 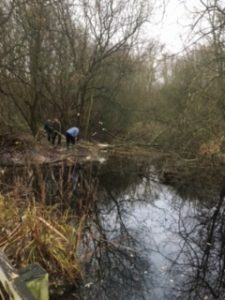 We will be cutting down and trimming trees and bushes as part of the work recommended by the environment agency to create a nursery for juvenile fish as part of a restocking program. Please bring tools if you can. This entry was posted in News & Events on December 11, 2016 by Jason Rackley. Calling all members to be aware of Pennywort and it’s identification. If you see this weed on any of our waters please notify us asap. This weed is an invasive species that is crippling other parts of the colne with devastating consequences. Attached link with description and control measures. Type Floating Pennywort. This entry was posted in News & Events on November 18, 2016 by Jason Rackley. Hi all ill start with a big thank you to all that attended the work parties at Moorlane and hithermoor, We had good numbers on both days which really makes it easier to complete our aims in keeping our waters enjoyable for all anglers. The colne has been fishing up and down with the weather but still getting news of Chub and Barbel coming out along both ends of the river. Also good numbers of Roach, Dace, Rudd & Chub being caught to float fished maggots with the occasional Small Barbel (under a pound) showing which is great for the future. 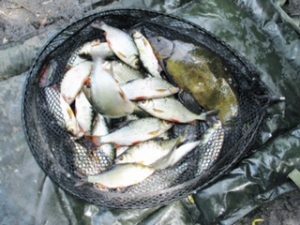 The Floodrelief fished well for the first half of August with Lots of Bream coming out to all methods,The occasional Tench has been reported as well as one coming out in the silvers match and plenty of silver fish. 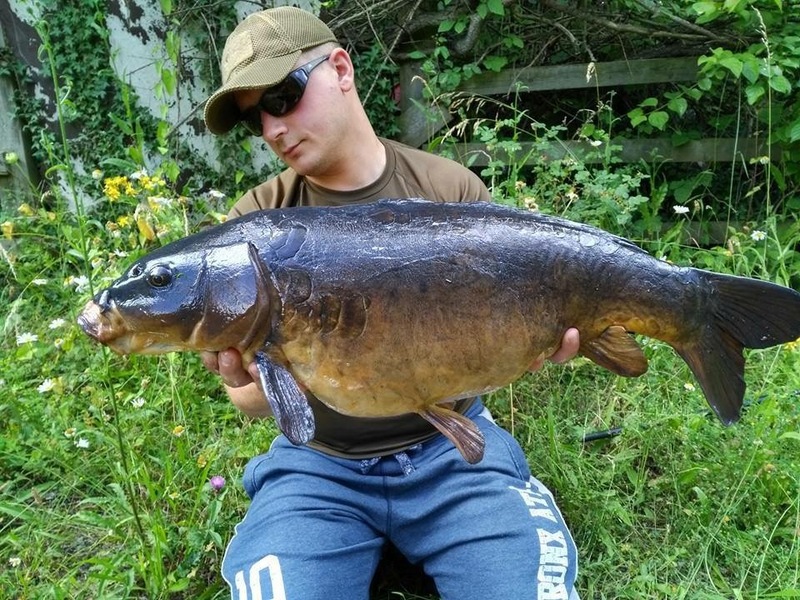 Carp have been showing them selfs for the first couple of weeks but then stopped feeding for the last couple of weeks as they do with the weather being so warm but lets hope they are hungry for the cap match ? . 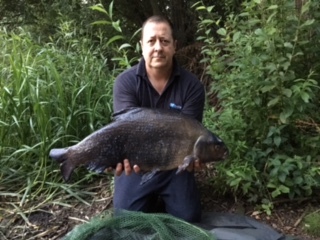 Moorlane front lake has fished very slow with Rudd and Tench reported but lots of weed present so limiting swims, The Bailiffs have been regularly raking swims but is very time comsuming and hard work in the hot weather.If you wish to rake a swim please feel free to do so but only if no one else is fishing ! Moorlane Long lake has been fishing very well with reports of Carp from the surface and bottom, Tench getting caught on the method and Bream caught by any method. Rudd and Roach in numbers to maggot Ledgered or float fished with the odd skimmer mixed in. TVAA waters, Sadly we never get any reports about these so if you fish them would you please give us a small catch report so i can add it to the next News Letter. Septembers meeting is on Thursday 15th at 8pm at the wheatsheaf Pub in Stanwell please feel free to come along. This entry was posted in News & Events on September 3, 2016 by Jason Rackley. The annual Carp Matches this year are on the 3rd and 4th of September at hithermoor and 17th and 18th of September at Moorlane (Long Lake) . Anyone interested in entering would you please contact myself , Angela or Richard ,or contact us via Facebook so we have an idea of numbers so we can arrange both venues if lots of interest. This years Carp Match was won by our very own Fisheries Manager and Bailiff Richard Drummie. 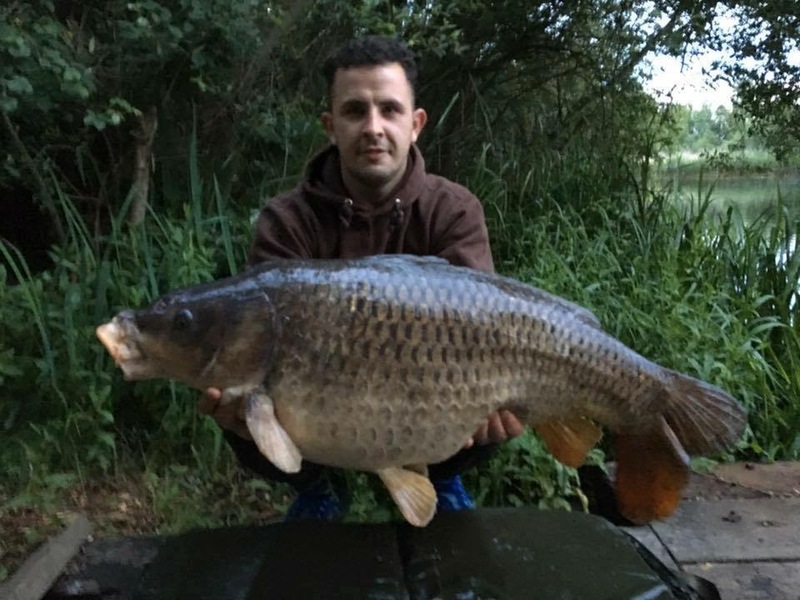 Well done Rich with a winning weight of 30lb 5oz ,Rich had a 13lb 4oz common on the first leg at hithermoor and then topped it up with a 17lb 1oz common from the long lake Moorlane. Second was Tony Mills with 13lb 4oz Common and yes you had to see it to beleave it but it was the same fish, I Witnessed it for both anglers and took the pictures, Incredible. 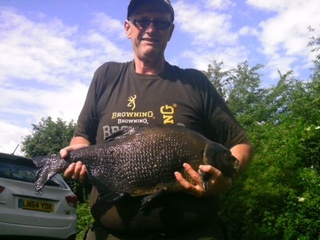 As for the other competitors no other catches apart from one of our Junior members caught a PB 8lb bream well done Stanley Watson. Stanley,s bream will see him entered in to the Junior Trophy for this season. 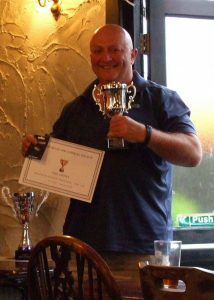 Well thats two for two for the bailiff team with the Pike match next can we make it a hat trick ? This entry was posted in News & Events on August 15, 2016 by Jason Rackley. 6th Mark Sweetland, 7th Min, 8th Steve Smith,9th John Farrah,10th John Wilcox and Cliff. Note The next Matches are the Carp Matches in September 3th-4th at Hithermoor and 17th-18th at Moor Lane, If you wish to attend these Matches could you please tell Rich, Angela, or Myself as there are limited swims so match may have to be split. This entry was posted in News & Events on August 7, 2016 by Jason Rackley. Well the new season has started and its off to a flying start with a new lake record for Hithermoor of 36lb 8oz,s the big common on the first day of the season. I was lucky enough to witness this immaculate looking fish caught by Gavin, well done. There have been a number of fish out of hithermoor some old like Two Tone at 27lb and a lot of new up and coming fish from 6lb to 15lb which is very good for the future of the fisheries as well as the new members young and old getting amongst the fish with new PB,s. We have also seen an unpresidented amount of Bream out from skimmers to a whopping 12lb 6oz. Tench out to over 5lb and two Barbel out of the flood relief. Plenty of silver fish coming out with bags of 15lb plus reported. River colne had a slow start but has now caught up with lots of Roach ,Perch ,Dace and bleak reported a 5lb 9oz Chub from the upper end and Barbel to double figures from all parts, You no when the river is fishing well because the Barbel anglers are quiet !. Moor lane has,nt stopped with carp on the long lake up to 20lb and in numbers too, Tench to over 7lb and Bream plus reports of Rudd perch and pike. Front lake has fished slow but reports are Tench , Rudd , Carp , Perch and Pike. In all a very good start to the season and lets hope a very good year. 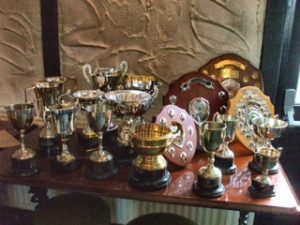 Last Thursday night at the Club meeting it was Trophy night for everybody that put forward there catches from last season a great night was had by all that attended. 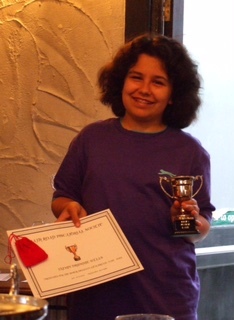 The winners received a Trophy plus certificates and badge relevant to species caught. Unfortunately Not all trophys were awarded as no entrys were made for some species so please record your catches photo them and get them witnessed so next year we can award them all. 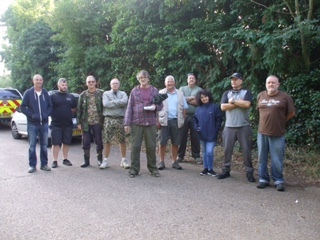 There was also the raffle for the work party attendees with some great prizes on offer from 5 kilo of bait to a meal for two , up to twenty prizes in total.Dates to remember we have two work partys in August 13th at moor lane and 14th at hithermoor [river colne] Please attend one if you can as many hands make light work. The next club meeting has been moved to the 25th August would be good to see you there. Tight Lines . This entry was posted in News & Events on July 24, 2016 by Jason Rackley. This entry was posted in News & Events on July 23, 2016 by Jason Rackley.